Since 1946, Manchester Tank has been a leader in the manufacture of pressure vessels, compressed air tanks, and air receivers. Their product line includes 10-10,000 gal. 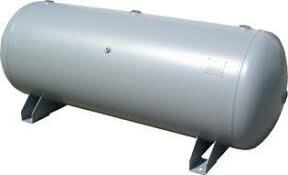 vertical compressed air tanks, 140-535 gal. epoxy-lined water tanks, 60-400 gal. vacuum receivers, 10-2,560 gal. horizontal compressed air tanks, and horizontal grasshopper and gas-engine driven tanks. All products meet the latest edition of the ASME Section VIII Division 1 code. Vessels listed are "U" stamped and registered with the National Board of Boiler and Pressure Vessel Inspectors. Capabilities include custom-built pressure vessels to many other sizes, pressures, and codes, such as American Bureau of Shipping (ABS) and United States Coast Guard (USCG). Most designs include Canadian Registration Numbers (CRN). Exterior surface painted with one coat standard shop primer. Special exterior and interior coatings available upon request. A complete catalog is available for your convenience by clicking here. Tank kits are available to simplify installation by providing all necessary drain kit fittings, a safety release valve, manual ball valve, and pressure gauge. See Tank Kits under Accessories to order. FOB: Clearwater, FL. Products shipped by motor freight carrier. For information on additional models and pricing call Pennington Associates at 727-535-3200 or email sales@penningtonassociates.com.